I’ve cycled for most of my life,” Chris Lewis-Smith says. “I’ve done some time trialling, but touring and cycling to work are my biggest interests. “I had my accident in 2004. I was riding to work over a level crossing. I’d probably been over it every day, but on this particular day I was riding over it and the next thing I knew, my face had hit the rails and the concrete. An investigation later discovered my front wheel had gone down between the crossing’s steel-edged plates. “One of the things doctors look for after a cycle crash is broken wrists or damage to the hand, but there wasn’t any of that because I hadn’t had time to put my hands out to break my fall. Instead I broke my jaw, smashed the bridge of nose, fractured my left eye socket, lost all my front top teeth and a lower front tooth – I’ve since been the subject of a lecture at one London hospital because my injuries had never been seen at the same time on one patient. “I lost a lot of blood and nearly died at the scene. I also had to have a tracheotomy as my airway was closing due to swelling. But I was very lucky that a lady called Jo who lived near the crossing was a nurse and really she saved my life. There was an awful lot of bleeding from my face, but she managed to stem it. Jo’s young son Luke kept running into the house to bring more towels to stop the bleeding. To this day I still owe them a set of towels! “I was in hospital for three to four weeks. I had two big operations, one of which was seven hours long. I spent some time in a high dependency unit on morphine. Then I developed MRSA and had to be isolated,” Chris says. “But it was particularly bad for my family because, while I couldn’t see myself, they had to look at me – I wasn’t a pretty sight. The first time I saw myself was when I asked for my CD player to be brought in. I got a disc out and I saw my reflection in it – it wasn’t good. “Eventually I came home and I started to go out a bit. But it was a bit like being the Phantom of the Opera, people would turn away in the street, so I got a scarf and a hat. “Then I heard that the local CTC were having a meeting in a pub with a ride out to it. A friend of mine offered to drive me there, but my son Tommy, who was about 11 at the time, said: ‘No, you can ride that, Dad.’ It was a three or four-mile route down a track through the woods. I did that and that was my first ride back on the bike. “Initially I just did very short rides. It took me a while to get back to any sort of distance because I’d not only lost a lot of blood, but weight and strength, too. But the act of just getting on a bike and even going a mile to the shops was a start. “The swelling took a while to come down and I spent a lot of time without any teeth – it’s not a good look,” Chris laughs. “But apart from a little bit of scarring on the bridge of my nose and my face being a slightly different shape, you now wouldn’t know anything had happened to me. “That’s all because I was lucky and at the Princess Alexandra Hospital in Harlow where I was treated, there was a maxillofacial surgeon called John Carter. He rebuilt me. So after my accident I decided to support Saving Faces. Saving Faces is a charity founded by consultant surgeon Iain Hutchison – who is a cyclist himself – which does research into maxillofacial surgery [see at bottom of page]. I’ve ridden London to Paris to raise funds for them, and I’ve just come back from cycling around the southern United States. “There were four of us – all rookie Brits, including my son Tommy – cycling in the desert. We were planning to ride a section of the Great Divide off-road route, but that wasn’t possible as the trails out of Silver City were closed due to fires. So we took a route 315 miles north to Albuquerque. 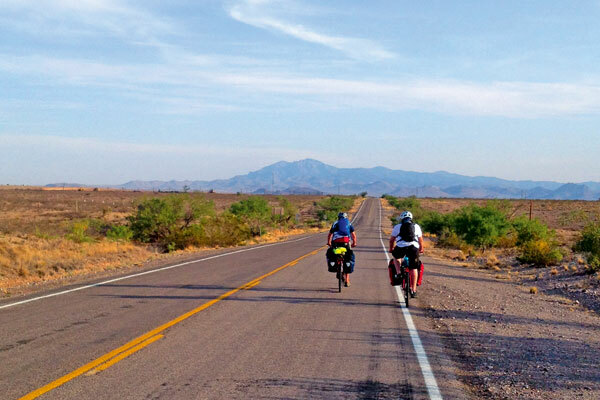 “We cycled on country roads, dirt roads and sometimes the hard shoulders of Interstates, which is legal in New Mexico, when there was no alternative. The heat took some getting used to, as did being chased by farmyard pit bulls – that sure helps your sprinting! “It was a real adventure, but then cycling has been an important part of my recovery. There’s more than just the physical side of cycling, there is a definite psychological advantage to cycling, too. Now I cycle up to 200 miles a week. “There have been no lingering effects from my accident. I’ve been checking to see if there is any sort of post-traumatic stress, but I’ve had nothing like that. I sometimes relive the moment when my face hits the ground, but it really is all in the past. I had kept the local newspaper clipping about my accident, but I found it the other day and I threw it away. Based at St Bartholomew’s Hospital in London, Saving Faces works alongside maxillofacial surgeons from across the country to carry out groundbreaking research into a range of facial conditions and oral cancers. This year’s big fund-raising family cycle day will take place on Sunday, September 8 at the Redbridge Cycle Centre in Hainault.